This article first appeared in the Shadowland newsletter, n° 28 January 2018. Sn is a limited private circulation digital newsletter produced as a supplement to the Book ark and is archived as part of the National Library of New Zealand’s National Digital Heritage Archive. Back issues of the NfB can be found at: State Library of New South Wales at: http://pandora.nla.gov.au/tep/155108. 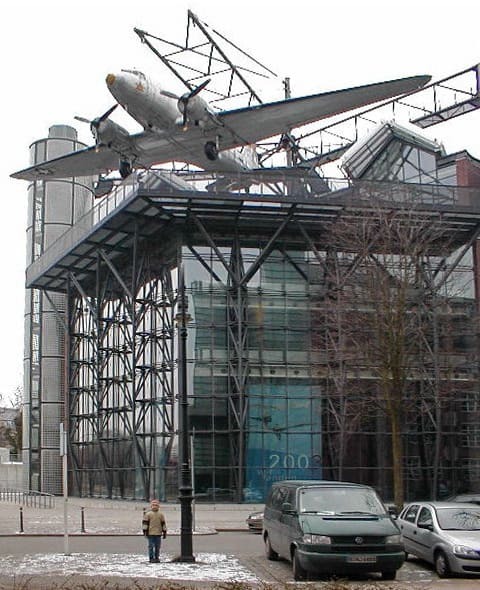 The Deutsches Technikmuseum in Berlin is one that I have been to several times before. This was to visit their Bibliothek (Ger., Library) of over half a million volumes as well as the Historisches Archiv (Ger., Historical Archive). The latter houses a collection of over 7,500,000 shelf metres of documents containing the archives of over a hundred major companies. As well as the papers and collections of over three hundred and fifty individuals. In addition, company grey literature, travel brochures, postcards, maps and plans. My interest was in the business records of the internationally famous Berlin type foundry, the H. Berthold AG, whose papers were deposited here when it closed. They were yet to be organized but my point as always is: Collect while you may. You can always organize and/or catalogue material later. But you cannot organize / catalogue / make available any material which you failed to collect when it was offered, especially when it is then destroyed! The name translates as the German Museum of Technology or just as well as the National Museum of Technology. Around 1900 the city of Berlin was the largest metropolis in continental Europe. As the pamphlet Route der Industriekulture Berlin (Ger., Route to Berlin’s industrial culture) maintains, Berlin was where international economic, technological and architectural history was made (p. ). Especially in the field of electronics which is why Berlin came to be known as the ‘electropolis Berlin’. The Deutsches Technikmuseum is situated in the middle of Berlin in a complex of former industrial buildings at the famous Anhalter railway station. The museum covers some 26,500 square metres of space with anything from steam trains, cameras, an actual windmill, classic cars and even ‘the first computer in the world’. And a huge section of ships and on shipping. Odd for a land locked city in the middle of northern Germany but then Berlin is also a city of rivers and canals and especially wetlands—all those lakes. Unlike our museums in Australia, the history of paper and printing is also given some prominence. Not the prominence they deserve, mind you, as they are just treated as two, i.e. three, subject areas amongst many. But these are given quite a large area of floor space each and well worth the visit. They display what most museums including printing museums display—a selection of the old and interesting to give the general punter an overview. Seen it all before? What makes such museums worth visiting is that they have on display different versions of printing, type and paper machinery and equipment than the kind you generally see in Australia, New Zealand or the UK. Before you even get to the paper and printing halls I noticed a cabinet displaying the Objekt des Monats (Ger., Object of the Month). This was of something that I and perhaps some others reading this are familiar with—the monumental Gesamtkatalog der Wiegen-drucke (Ger., Union catalogue of incunabula) as used by researchers into early printed books all over the world. When its producers, the Deutsche Staatsbibliothek zu Berlin – Preussischer Kulturbesitz, needed special display characters, one of the typographers at Berthold created a special type face based on the historic Alte Schwabacher for use in this publication. On display, the story of its creation and use. Printing and type history turns up everywhere. The section on paper making is called Papiertechnik (Ger., Paper Technology) and is relatively small. It is less about the history of paper making than a space for the public to experience paper making for themselves. Along one side of a narrow room is an example of a scaled down version of a paper machine to give visitors an idea of what a paper machine looks like—from the laboratory of and a donation by the Bundesanstalt für Materialprüfung (Ger., National Institute for Materials Testing). These were not miniature or model paper machines. Imagine the cost of running a paper machine the size of four or more double decker buses when you just wanted to see how something would turn out. So these smaller versions were built—I remember being told they cost several millions of dollars each—for production testing. Unfortunately, the one here is not in use for demonstrations. I was told that this is because two staff are required to run it but this is not the case. A few weeks later at the Alte Dombach paper history museum in Bergisch-Gladbach near Köln I saw a similar paper machine being operated by just one staff member. Who then handed out sample rolls of the paper you had just watched being made. My interest was more in the printing side of things and especially to check out the Stanhope iron hand press which is on permanent display in the next section. This is called Schreib- und Drucktechnik (Ger., Writing [i.e. Type] and Printing Technology) although this is really two sections / halls, being preceded by one on type founding and setting. Perhaps even three if you consider the large Lehrdruckerei (Ger., Educational Printery) as a separate section as well. Such museum displays are generalist by nature and designed to show in the limited space available a general range of machinery and equipment. So wherever you go you do tend to see the same old material on display—Linotypes, Monotypes, a traditional letterpress comp room (Berlin, 1950s)… But visiting printing museums overseas you also get to see some more unusual items. Here it is the Typograph which, after all, was manufactured for close to a century in Berlin. There is a late nineteenth century hand caster from Berthold but also a Foucher Frères (Paris) ca. 1890 caster, a Mergenthaler Simplex caster ca. 1904 as well as a Nebitype type and space caster. But the most interesting of all—and worth the trip by itself—is a display of ancient punches in a section showing how types are engraved, punches made and then the individual metal type cast. A donation from the old Reichsdruckerei (Ger., Imperial Printery) and the large historic cabinet—a kind of type wardrobe—alone would have antique furniture buffs in a swoon. This leads into the section displaying various printing presses. It begins with a ‘common’ or wooden hand press, a replica based on one of the eighteenth-century presses at the Plantin Moretus Museum in Antwerpen. There is also a Columbian hand press (see image gallery link below)—dare I say, disappointingly, for it is ‘only’ a Greig made in Edinburgh ca. 1835. And not a German Columbian as I would have hoped for. Though I was not as disappointed as I might seem. The Columbian looks to still have its ‘original’ paint work with the eagle in a matt black but with touches of gold (beak, oak leaf sprig). As well as some red for the mouth of the counterweight and elsewhere. There are the usual: a Hamm (Frankenthal) cylinder press dating from ca. 1895, a ca. 1910 Boston bench top platen, as well as a Heidelberg windmill—the only nod to modernity. My guide, Stefan Krämer from the Lehrdruckerei, told me that he will be giving demonstrations on the new press just arrived, lithographic printing from stone. But the jewel is of course the German Decker Stanhope (see image gallery link below) manufactured in Berlin in 1835 (no. 4). This was the gift of the media giant the Axel Springer Verlag which seems to have had some kind of company printing museum at one time. Finally, a walk through the Lehrdruckerei. This is large and spacious with ten places available for visitors to print at. We are here all overfamiliar with small bench top presses such as the Adana but these were unknown to my guide. Here printing is all done using the same small bench top cylinder proofing presses. And not from hand set metal type—I guess they are concerned about the complexities of the uninitiated using small type (or souveniring)? There are bins with large wood type as well as larger printers’ blocks (illustrations) which are here used to print from. Krämer also mentioned to me that there is now a German Facebook group called the Verein für Schwarze Kunst (Ger., Associa-tion for the Black Art). The museum was packed when I visited, especially with parents and young children. And what must have been Kindergarten groups judging from their size and shape—and all decked out in bright yellow safety coats! Well worth a visit if you are ever in Berlin. Also check out the website (see below for details). Much but not all information is available in other languages including English.